Mosaic Earth is coming of age. Mosaic Earth and her daughter Mosaics are en route to becoming a creative, empowering way to generate and empower individuals and communities everywhere to become visible, find a voice, and stand up for life on earth. It’s been quite a story to get to where we are now. In the run up to the Copenhagen Climate Change conference in 2009, Susannah Darling Khan was besieged by the feeling that she had something she had to do. She had heard Ed Milliband on the radio saying that they (the politicians) did know about the seriousness of climate change, and they knew about the level of commitment needed to take appropriate action, but that they did not feel the electorate were behind this. He made a passionate plea to those in the public who were aware to make a much bigger noise to compel and empower the politicians to make the big leaps necessary. Susannah felt that she was being asked to find a way to support people all round the world who cared about the earth to become visible to each other and to those in power. She knew that this would probably require digital expertise, which she does not have. After resisting for a several weeks, telling herself that she was not the right person and did not know how to do this, she eventually decided to take courage and to just begin to do something. 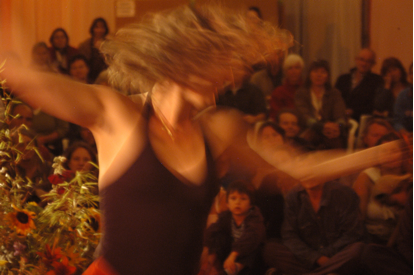 Susannah is a dancer, writer and singer who, together with her husband Ya’Acov Darling Khan, has developed a method called “Movement Medicine” in which conscious dance practice becomes a way to grow embodied consciousness, empowerment, global citizenship and the joy of being alive. She called Nick Hart Williams (who originally brought the Awakening the Dreamer symposium to the UK) and that conversation changed everything. He agreed with the digital drift of her thinking, and put her in touch with Peter Armstrong and Anuradha Vittachi who at that point were the directors of “One World” and its subsidiary “One Climate”; organisations committed to using the digital revolution to empower people. Peter and Anuradha met up with Susannah and Nick in an Indian restaurant north of Euston, London, and said “YES!” with an alacrity and unanimity which surprised even them. With their technical know-how and experience of how digital technology can be used to create bottom-up citizen empowerment and the visionary ‘fit’ between all of them, the project began to have wheels. 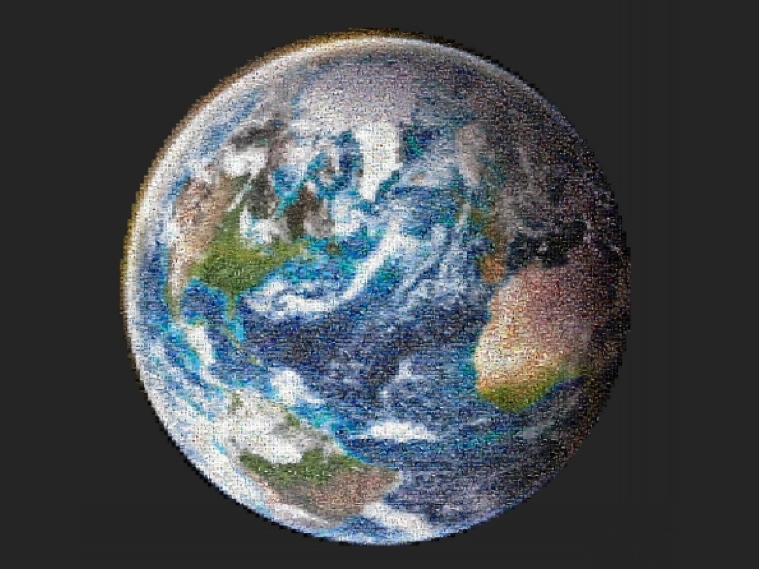 They developed a vision of the Mosaic as a digital picture of the planet, built as a mosaic of tens of thousands of “pictograms” from an individual somewhere speaking out for life on earth. Each pictogram is a picture or video together with a personal message expressing that person’s concern to protect life on earth. To pull all this together, OneWorld would have to write new software, based on the deep zoom technology, ‘Silverlight’. 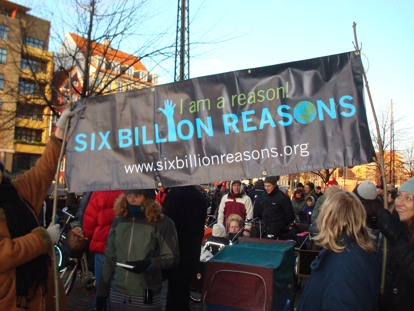 Originally it was called “6 Billion Reasons” – each person being one more reason for action on climate change. And its first focus was on raising citizen power to support the progressive negotiators at Copenhagen. Susannah quickly learnt that something which has a simple, easy to use user-interface is not so simple and quick to develop behind the scenes. A woman who met Susannah in a neighbour’s garden in Devon heard the vision for this project and gave £10,000. Peter and Anuradha had a skilled and committed team of software engineers at One Climate, and with the first funding Dr. Ken Kitson and Jamie walker set to work. 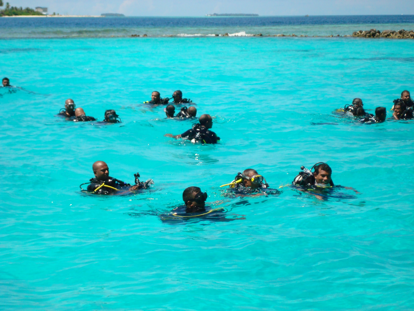 That autumn, in 2009, in the run up to Copenhagen, Susannah and Ya’Acov had their 20th wedding anniversary, and went to the Maldives for a belated honeymoon. 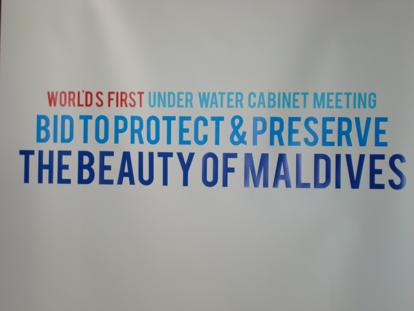 They stayed at an eco hotel, and through a series of happy meetings, ended up attending the then Maldivian governments extra-ordinary under water cabinet meeting attended by the world’s media, in which the cabinet signed the Maldive’s statement to Copenhagen. Susannah and Ya’Acov were able to interview the president, the vice president and many others, and sent footage back to Peter and Anuradha, which became part of the original mosaic. At Copenhagen, Peter and Anuradha were inside the conference working with One Climate’s team of eight to keep the world informed about what was going on. Their all-day broadcasts throughout the fortnight reached an audience of over 4 million right around the world. But Copenhagen did not make the breakthroughs that were yearned for by so many. The millions of marchers were largely ignored by those at the negotiating tables. And 6 Billion Reasons didn’t yet have the effectiveness they had hoped for. But Peter, Anuradha and Susannah all felt they had started something which was not finished, which had a potential to make a real difference. Susannah and Ya’Acov made a commitment to a make supporting the Mosaic an intrinsic part of their online shop business (www.movementmedicineshop.com) in order to cover the initial costs of creating and maintaining the Mosaic. At the World Economic Forum in Davos, Anuradha met an old friend, Ben Verwaayen, former head of BT and now running Alcatel Lucent, and took the opportunity to show him the Mosaic and enthuse him about its potential. 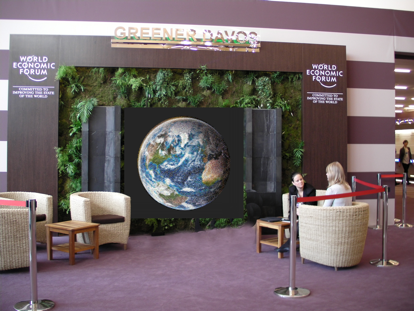 The possibility was discussed of it becoming an exhibition feature at future Davos meetings. 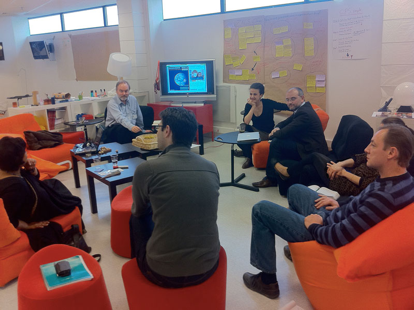 As a result a fascinating brainstorming session was held at the Alcatel new-media centre outside Paris, at which a number of new ideas for the Mosaic emerged. This is turn led to a commitment to offer pro-bono software support for the project. So Anuradha and Peter travelled to their Murray Hill University, New Jersey, where they worked with Chris White on enhancements to the Mosaic software. Support came next from the Global Climate Change Alliance, who saw the opportunity to promote the Mosaic and the UNFCCC climate conference in Cancun, Mexico. Their funding also helped the project to develop further, as thousands more people where adding their pictures and messages to the site. The project was presented to Prince Charles and promoted as part of the publicity for his own feature film, Harmony. In January 2013 Anuradha and Peter retired from One World and One Climate, passing on their international work of 18 years to a committed young team. To continue their own work, Anuradha and Peter decided to set up a charity in remembrance and honour of their youngest daughter Boo, a campaigner for integrated health who died in 2012. Called the Hedgerley Wood Trust, the charity is dedicated to supporting the growth of worldwide empathy. One World and One Climate had agreed to let them to take 6 Billion Reasons with them as they retired, and to write off the “debt” as a retirement present. And Dr. Ken Kitson agreed to do the work to rebuild and enhance the digital platform for the Mosaic so that it can be supported on the Hedgerley Wood Trust website. 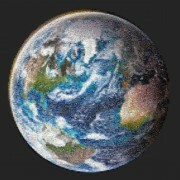 It can now be seen there at the new url – www.mosaicearth.org. Susannah, Peter and Anuradha met to discuss next steps and created a new direction for what is now renamed Mosaic Earth. Agreeing that the problem with the old 6 Billion Reasons Mosaic was its diffuse focus, they realised that they could develop “daughter mosaics” of the “mother-ship” Mosaic. 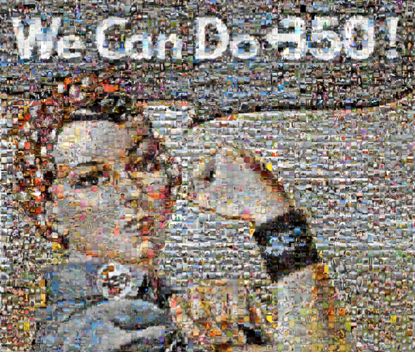 As a pictogram is added to a “daughter mosaic” it is also automatically added to the “mother-ship” which would become an amalgamation of voices of global citizenship. They will also strengthen the interface between the Mosaic and other social media so that, for instance, as someone puts up a pictogram, it can be simultaneously sent to their social network with a ink to the Moaic. As the American environmentalist Van Jones says: “A standing ovation starts with one fool standing up”. Empathy grows when we can see and hear each other. We want people power to be given this additional means to express themselves visually, verbally and through music, to touch, connect and empower people. Citizens across the globe need to know they are not alone. We need the encouragement of being able to see and feel ourselves as a part of a tidal wave of emergent care for each other, the future and for all life on earth. So, the project continues, inspired by Boo and her intelligent empathy with all life.